I love your blog, your freebie kit, and your witness! Thank you for letting His light shine through! these papers are WONDERFUL! Thank you so much for sharing your talent!!! :) Have a LOVELY day! Very delicate and perfect for spring photos. Thank you. Thank you so much for this Freebie. I want to let you know that I posted a link to your blog in Creative Busy Hands Scrapbook Freebies Search List, under the Elements or Papers post on Apr. 29, 2009. Thanks again. I'm happy to discover your blog! it's wonderful! 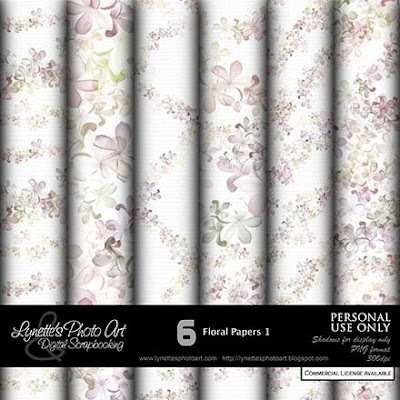 thanks for the floral paper! yes Jesus is Lord! and my savior! see you soon! Thank you for sharing your beautiful talent that God has gifted you with, I love the papers. Hi...just wanted to let you know that I downloaded some of your floral pieces. They are simply stunning. Thank you so very much for sharing your beautiful talent. Your blog is lovely and some of my favorite music is here, too. This is beautiful! I love these pastels! You truly have a gift for design by the grace of God!